Very nice article about our field trip to Deer Park for Road Trip Nation. Very cool. The article is written by Kim Melchor. She is a great supporter of AVID (Her son is a senior in our AVID program). Define your own road in life. 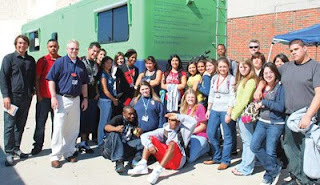 Students who attended the event at Deer Parks High School’s south campus had a chance explore the big green RV, as well as watch an live interview with a local businessman. State rep. Wayne Smith was also in attendance. Road Trip Nation in broadcast on Sundays at 12:30 a.m. KUHT-TV Channel 8. Interviews are available on the program’s Web site at http://www.roadtripnation.com.